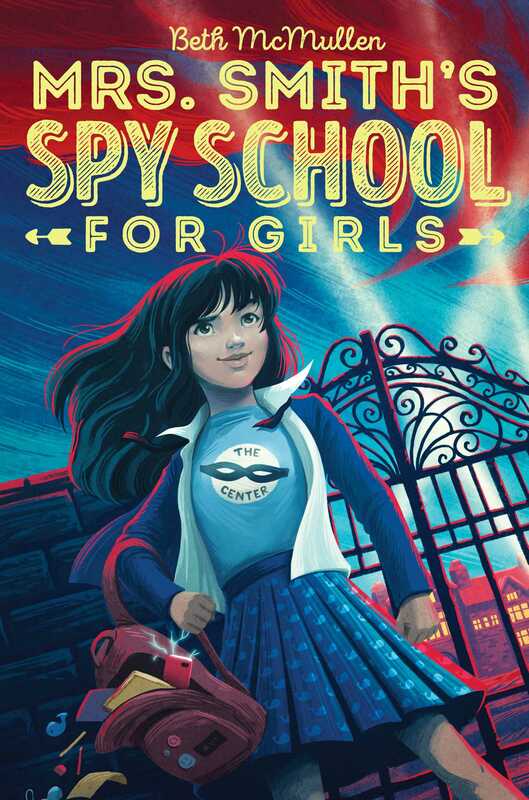 A girl discovers her boarding school is actually an elite spy-training program, and she must learn the skills of the trade in order to find her mother in this action-packed middle grade debut that’s perfect for fans of Stu Gibbs. After a botched escape plan from her boarding school, Abigail is stunned to discover the school is actually a cover for an elite spy ring called The Center, along with being training grounds for future spies. Even more shocking? Abigail’s mother is a top agent for The Center and she has gone MIA, with valuable information that many people would like to have—at any cost. Along with a former nemesis and charming boy from her grade, Abigail goes through a crash course in Spy Training 101, often with hilarious—and sometimes painful—results. Abigail Hunter has her seventh-grade year at Sweetbriar Montessori all planned out—fun, friends, and field trips! Instead, she receives a letter that tells her she has been accepted into a highly respected New England prep school, only to find out it's nothing like what she was expecting. The Smith School for Children is also home to the ultra-secret Center, or Mrs. Smith's Spy School for Girls. 1. Consider the book’s cover art. In what ways do the images represent or symbolize the events that occur throughout the course of the book? What is the significance of the whales? Why are they depicted on Abigail’s skirt? 2. The title of the book is Mrs. Smith’s Spy School for Girls, but the actual name of the school is The Smith School for Children. What impression does the title make and how does it shape your vision of this community and its students? Use examples from the book to support your answer. 3. Think about the cast of secondary characters: Izumi, Charlotte, Jennifer, Toby, Veronica, Mr. Roberts. Who did you like the most? The least? Why? Of all the characters, whom did you identify with the most and why? 4. The book is told in the first person by Abigail. If you could have a different character tell the story, who would you choose and why? 5. Action and adventure stories, as well as spy stories, are popular literary genres. Can you name other teen spies, from books, movies, or TV? In what ways does Abigail’s style and technique differ? What makes Abigail unique? Give examples to support your answer. 6. The setting of the story is at a private school in Connecticut, as well as in San Francisco and New York City. Do you think the Smith School for Girls could be a real place? Why? What does the author do to help you visualize each of these schools? Do you feel you know these places? Where else does Abigail spend her time in the story? 7. As Abigail begins to understand more about her mother, she realizes that her life is entirely different than she thought. Give some examples of events that happened in the story and how they are connected back to earlier events in Abigail’s life. How do the bits and pieces of Abigail’s past and present fit together? 8. What are some problems that Abigail faces as she is thrust into the unfamiliar role of a spy? What can you infer about her character as she takes on this new responsibility? How would you handle this new identity? 9. Despite the book’s title, Toby is a vital character in the story. How does the author treat gender norms, stereotypes, and cultures? Are there any gender stereotypes depicted in the story? 10. Throughout the story, the author uses phrases such as “cut to the chase,” “waiting for the other shoe to drop,” and “been to Timbuktu.” Why does the author do this and why is it important? Find other examples of phrases that are unique to a spy story. 11. Each chapter of the book has a heading in a who, what, when, where, or why format. Why does the author structure the chapters in this way? 12. Abigail is thought to be too young to be a spy. Do you agree or disagree? At what age should one be able to become a spy? What are the circumstances that lead to Abigail being used to find her mother? 13. Abigail’s mom, Jennifer, talks about self-reliance: “‘When things are really crazy,’ she’d say, ‘that’s when you need to have the most confidence in yourself and be bold even if it's scary.’” What does this mean? Find examples in the book that show how Abigail has to be self-reliant. 14. Abigail has to face a moral dilemma: save herself or save Suzie. What does Abigail end up doing? What is the important lesson that Abigail learns from this predicament? 15. How does Abigail grow and change over the course of the book? What are some life lessons that she has learned? Reread Chapters 23 and 25. What are the lessons here and what does Abigail want? Do you agree with her choice? 16. In the last chapter, Jennifer tells Abigail that “parents aren’t your destiny.” What is she trying to tell Abigail? Can you apply this advice to your own life? 17. Based on the events that happened in this story, predict what might happen for Abigail and her friends in the next book in the series. 1. Abigail had a crash course in spy training. If you had the opportunity to design and create a curriculum for spies, what would be in your beginning courses? Name your curriculum Spy Training 101 and include subjects such as disguises, secret codes, gadgets, chromatography, secret compartments, spy cameras, self-defense, etc. How might your classes include subjects such as chemistry, physics, computer science, engineering, physical education, problem solving, and teamwork? Make sure your curriculum has at least four different classes. 2. Cryptography and ciphers have long been a part of sending secret messages. Try the different secret codes on the CIA Kidzone website and decide which would be a good fit for Mrs. Smith’s Spy School for Girls: https://www.cia.gov/kids-page/games/break-the-code. Using the different codes as a model, can you create a new code for the spy school? 3. Create a laser maze obstacle course for you and your friends. Using ideas from http://www.mykidsadventures.com/string-laser-maze/ and the catacombs from Mrs. Smith’s Spy School building, how would a laser maze work and what would it look like? Design your idea on paper and create a model to represent the maze in the catacombs. 4. Design a spy gadget, or turn an everyday item at home into a spy gadget. 6. The Frick Museum and the statue of Persephone are part of a clue left by Abigail’s mom. Using the virtual tour at the Frick Museum (http://www.frick.org/visit/virtual_tour), start at the Garden Court and recreate the trail that Abigail and her friends follow from the symbols that Abigail’s mom has left as a doodle. Create the doodle itself from the description in the book and from looking at the virtual rooms. 8. At the beginning of the book, Abigail receives a letter from The Smith School for Children. On the letterhead, there is a crest and a coat of arms (bright red and blue). Design the coat of arms and crest based on your reading of the story. What will it include? Be sure that your design is a symbol unique to the school and be sure to explain why you have included that symbol(s). Guide written in 2017 by Sharon Haupt, District Librarian, San Luis Coastal Unified School District.